Yee-haw! The Calgary Stampede started in 1912 as a way for Alberta to maintain a western heritage, culture, and community spirit. Our wonderful province worked tirelessly to entice farmers to move west, so that we could all enjoy a lively and flourishing farm environment and culture. Today, the Calgary Stampede celebrates the accomplishments of hard-working Albertans through live performances, rodeo events, parades, concerts, Stampede parties, and agricultural competitions. However, Calgary Stampede is arguably most famous for its cuisine: pancake breakfasts, BBQs, and unique, worldly inspired food items! Stampede kicks off this Friday, July 6! This year, why not localize your stampede experience by hosting your own farm-to-table inspired event? To make it simple, we’ve gathered some mouthwatering recipes that can be prepared using local ingredients, as well as some tips and tricks for hosting a spectacular event that your taste buds will love! The Caesar has been long associated with the Calgary Stampede, and this truly Canadian cocktail actually originated in Calgary in 1969! To prepare, simply run a lemon wedge around the rim of a tall glass, before turning it upside down onto a plate of celery salt. Fill your glass with ice, add 1 1/2 oz vodka, 4 dashes of Tabasco, 2 dashes of Worcestershire and the remaining juice from the lemon wedge. Add Clamato juice and a generous grinding of pepper. Don’t be afraid to get creative with your garnishes. Some fan favourites: celery, limes, olives, pickles, bacon, or even some beef jerky! Gemstone Marinated BBQ Skewers are the perfect no mess, no stress appetizer for your Stampede event. They are pre-marinated and pre-assembled, so all you need to do to prepare this summer BBQ favorite is throw them on the grill over medium to high heat for approximately 8-12 minutes. Gemstone Marinated BBQ Skewers are included in our One Month Supply Package. For custom requests, please email info@gemstonegrassfedbeef.com. The summer months in Alberta offer the best homegrown produce, and it wouldn’t be a Stampede event without charred vegetables fresh off the grill! Visit your local farmers market, or stop by Spragg’s Meat Shop to browse their growing inventory of fresh, local products. When you buy local fruits and vegetables, you’ll experience some of the best flavors the season has to offer! Not sure what’s in season? Visit your local farmers market and connect with the producers. Delicious Gemstone Burgers: A classic Doerksen family recipe! These savoury patties are a family staple for field dinners, lunches on the deck, and Sunday suppers. Make the burgers in advance and store them in your freezer before your Stampede event. All you’ll need to do on the day of is throw them on the grill! A winning burger, fit for a cowboy. Spicy Beef on a Bun: If it were possible to cram the experience of eating at the Calgary Stampede into a bun, this would come pretty darn close. Sweet, satisfying and the perfect amount of heat! Texas-Style Barbecued Brisket: Beef brisket and a backyard smoker? It doesn’t get more western than that! Put together a spice mixture to rub on all sides of the brisket, let it cure in the refrigerator for 4-8 hours, fire up the grill and cook over indirect heat for 6-8 hours, continue to baste with juices, lather with Texas-style BBQ sauce, serve and enjoy! Whether you need help choosing the right cuts of meat, finding a package that fits your budget, or simply have custom requests – we’re here to help! Please contact us by phone (587) 225-2477 or email info@gemstonegrassfedbeef.com to discuss your unique needs. Your guests can enjoy a taste of the rodeo with this fun and exciting cake! With a sophisticated flavour, and a rustic homemade presentation, who wouldn’t want to take a bite out of this decadent Chocolate Cowboy Cake? Keep the party going with late-night Cowboy Nachos: braised beef and beans loaded onto corn chips. 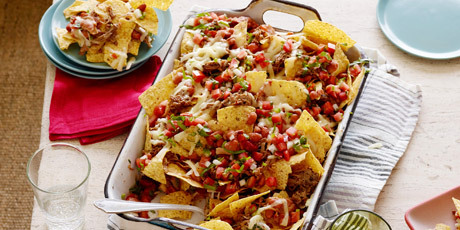 You'll never look at nachos the same way again. Get started on your farm-to-table event by ordering one of our freezer packages! Call 587-225-2477 or email info@gemstonegrassfedbeef.com.